Tuesday, March 5th, 2019. My day started about the same as every other day at the Alaska Zoo. I checked the computer logs and then made my way through the build up of emails I received during my weekend. I earmarked some American Zoological Association emails on olfactory enrichment for later reading. That might have been a bit of foreshadowing for the day I had in store. Once I was finished the computer work, I went to the animal commissary where I was met with a particularly pungent odor, like asparagus left in a gym bag. In one of the sinks, there were two separate bowls both with a yellow-tinged liquid with bits of dirt and debris sitting in the bottom. One was labeled “fox urine” and the other labeled “wolverine urine” and both finished with “for Angelica”. Nathaniel, the lead red fox and wolverine keeper knows that I collect yellow snow during the winter months to melt down and use as olfactory enrichment so despite the smell, my week was starting on a positive note. Once I got the urine sorted into labeled bottles and placed on the enrichment shelves, I grabbed the diet, small scale, water and training treats for the northern flying squirrels. I checked the outside thermometer, donned my coat and headed to their habitat. I replaced the frozen water bottles with the fresh ones, set their diet in its place, turned on the scale and started calling to them. Gaston poked his head out first but deemed it too cold and popped back into his nest. Nightcrawler came all the way out and sat on my hand for a few treats, then got onto the scale so I could get his weight (126g) and then came back to my hand for more treats. We completed our training session and I left to record the session and his weight in their log. Our Animal Curator Shannon called me about the American mink whose new habitat had just been completed. We met over at the infirmary to kennel him and move him to his new home for a few hours so we could keep an eye on him. We drove over with him kenneled in the electric Polaris and took a last safety check around the habitat with the help of four other staff members. The habitat was deemed safe so everyone aside from myself headed back out to the trail while I opened the kennel door. The new space must have been terrifying because he didn’t venture out for about ten minutes. He would pop his head out, fluff up, hiss and then dart back into the safety of his kennel. Finally he took a stroll around and started checking out every inch of his new home with the occasional dart back to safety. I encouraged him to explore by setting familiar things in the corners of the habitat and we started playing with one of his blankets. He seemed more and more comfortable so after about thirty minutes, I left him to explore. I headed back to the commissary to meet up with my intern for the day from King Career Center. She loaded up the diets for the moose and wolverines onto my cart while I cut up bananas for moose training. We took off to wolverines and she observed while I trained with both Olga and Jumbo. We swapped out their frozen water and opened up their shift pens so they could have access to their habitat again. We took a short walk over to the moose feeder and Uncle Fudge came right over when we called him, so we gave him some well-deserved banana pieces and part of his diet. I always compliment him whenever I see him. I let him know how handsome he is and told him his legs looked especially long today. We said “so long for now” to Fudge and went to check in on the mink in his new home. He seemed to be getting more comfortable as he was running around, digging in the snow and rearranging his furniture. While we were watching the mink christen his new digs, we heard some commotion coming from the wolverine yard. Both wolverines were lying on their backs rolling around on the snow. Olga found an uncoiled cardboard tube and decided to try to wear it. She then continued to squirm around on the ground while Jumbo tried to use her as a pillow. Next we made our way to the other side of the moose yard to the other feeder for the remainder of his grain and a training session. My intern and I each grabbed a banana bucket and a target stick and practiced dual targeting after which Uncle Fudge and I worked on his voluntary injection behavior and finished up with a nice helping of birch branches hung up on the fence line. Afterwards, we answered some visitor’s questions regarding the moose and his training before continuing on our day. While we were walking back to the commissary we stopped off at the muskox yard to help Sam clean before we took lunch. Zoo Director Pat had treated the staff to Cranbeary Special sandwiches from Polar Dip restaurant. This sandwich was on their menu in March as a fundraiser for enrichment for the polar bears and I was eager to taste it. After lunch, I helped my intern fill out some paperwork and chase down signatures for her KCC class. Moving from the break room to the commissary, we started prepping enrichment for Wednesday. We began with making mint cubes for the camels, yaks and alpaca. We then moved onto herring balloon pops for the seals. We managed to make two feather pies for the tigers (AAA with feathers stuck in and frozen) before the intern had to leave for the day. I said “hello” again to the mink for a midday training session. He seemed pretty distracted but he still did pretty well. Visitors nearby were able to see how smart he is and learn a little bit about mink. I headed back to the commissary to weigh out diet remainders and make diets for Wednesday. I was a bit late in checking the donation bin where visitors drop off food donations for the animals, so I went to the parking lot and retrieved a small bag of salmon eggs which I placed in the walk-in freezer. Because it was his first day in his new habitat, we didn’t want to leave Ripple in his new home overnight. I took the remainder of his diet and headed back to see him. He was very excited and bouncy when I arrived, even more comfortable with his surroundings. We had a productive training session ending with him kenneling and me returning him to his den in the infirmary. I still had a few pieces of quail left from his diet so I hid the pieces in some of his toys and in the pool for him to seek out and find later. I finished my day by entering my care data in his log and the general log. I then clocked out and headed home for the day. This article was written by Alaska Zoo Enrichment Coordinator Angelica Evans. Learn more about how animals benefit from enrichment in a zoo environment by clicking here. Our zookeepers also help wildlife and conservation research by fundraising through the American Association of Zoo Keepers (AAZK). Learn more about AAZK Midnight Sun Chapter here. Alaska Zoo staff and volunteers are heartbroken to say goodbye to Denali, the beloved leader of the zoo’s wolf family group. 10am polar bear enrichment is planned. Visitors can come with the zoo opens, pay general admission or use their membership for entry, then come over to the polar bear habitat to see the bears have ice pops. Zoo fans who can’t be here in person may watch the enrichment on our live polar bear camera, featuring an upgraded live stream allowing unlimited viewers. 2pm polar bear critter chat is planned. This is an informal talk to be held at the polar bear upper viewing area. Polar Dip’s new Cranbeary Special sandwich will raise funds for Alaska Zoo’s polar bears. Visit the Polar Dip restaurant starting February 27th and purchase a mouthwatering “Cranbeary Special” sandwich, $12 or $15 with soup. 50% of proceeds through the special in March will go toward a Giant Pickle fund for the polar bears. This was a favorite treat of Cranbeary and her companion at the Denver Zoo. We know Cranbeary and Lyutyik will enjoy this treat! Returning this year is “Perfectly Polar Bears.” The Alaska Zoo Distance Learning Program invites everyone to get up-close encounters and learn more about these Arctic icons and how they thrive during the winter season through virtual experiences, available Feb. 25 to March 1. Those interested in learning more about the program or to reserve a date and time for their group should contact Alaska Zoo Distance Learning Coordinator Shannon Ozee at 907-341-6462 or dlearning@alaskazoo.org. The Alaska Zoo has been dedicated to the conservation of Arctic and sub-Arctic species for 50 years; and on Feb. 27, the zoo will be celebrating one of the state’s most iconic animals on International Polar Bear Day. This annual holiday, hosted by Polar Bears International and celebrated around the globe, raises awareness about the challenges facing polar bears in the wild. Officially recognized as a threatened species, polar bears are struggling to hunt, breed and migrate because of rapid climate warming and sea ice loss. The Alaska Zoo actively promotes conservation of Arctic and sub-Arctic species through educational programs and partnerships with organizations like Polar Bears International, Alaska Clean Seas, U.S. 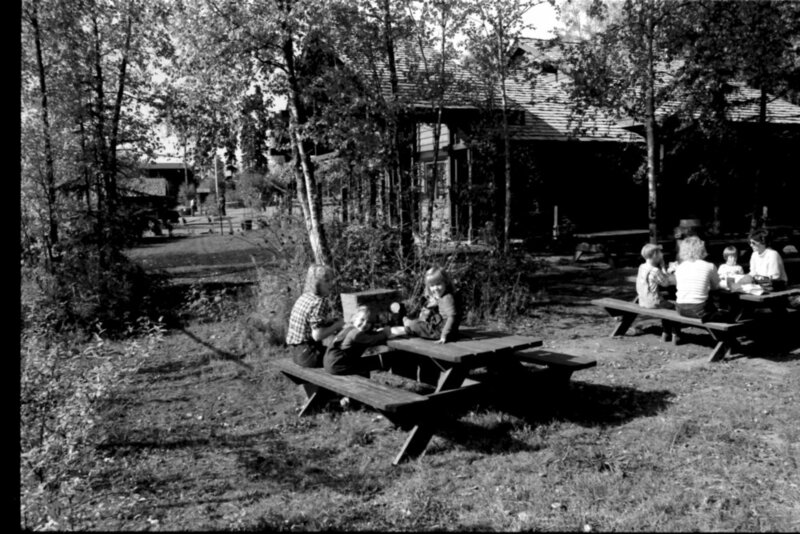 Fish and Wildlife Service and the USGS Alaska Science Center. The zoo’s knowledgeable team is also trained to be the first responders for polar bears who are impacted by emergencies on the North Slope in Alaska. Now home to two polar bears, the Alaska Zoo’s 19-year-old male Lyutyik, also known as Lou, got a female companion in October 2018 when the zoo welcomed 16-year old Cranbeary. After a customary three-month isolation period in the maternity den, Cranbeary joined Lou, and they got along well from the first encounter. A live web cam now displays the polar bear pair’s comfortable habitat, complete with a chilled pool, fresh salmon and toys. Another way to participate is to visit local restaurant Polar Dip. The south Anchorage restaurant is marking International Polar Bear Day by adding a mouthwatering new menu item and kicking off a fundraiser for the Alaska Zoo. Available through the end of March, and named in honor of Cranbeary, the new Cranbeary Special sandwich is a turkey and cheddar melt with cranberry chutney. Available for $12, or $15 with a cup of soup, 50 percent of proceeds from sandwich sales will be donated to the zoo. “When Cranbeary was in Denver, she and another bear favored a giant toy pickle, so we’re confident that is her favorite deli item! We look forward to using the funds raised by the Cranbeary Special to purchase a giant pickle toy for Cranbeary and Lyutyik to enjoy in their new shared habitat,” said Lampi. Polar Dip is open 11 a.m. to 6 p.m. Monday through Friday and is located at 12100 Old Seward Road in Anchorage. In addition to raising funds for Cranbeary’s new toy with the Polar Dip sandwich, the restaurant will have a collection jar for donations for the Alaska Zoo’s general fund. You can even get involved with International Polar Bear Day and support the Alaska Zoo even if you can’t make it Polar Dip or the zoo. Returning this year is “Perfectly Polar Bears.” The Alaska Zoo Distance Learning Program invties everyone to get up-close encounters and learn more about these Arctic icons and how they thrive during the winter season through virtual experiences, available Feb. 25 to March 1. Those interested in learning more about the program or to reserve a date and time for their group should contact Alaska Zoo Distance Learning Coordinator Shannon Ozee at 907-341-6462 or dlearning@alaskazoo.org. 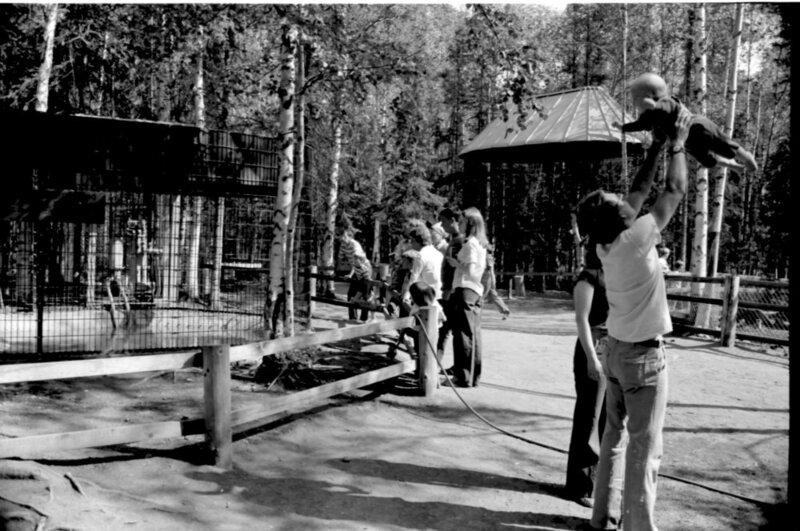 This August 2019 will officially mark 50 years since the Alaska Zoo was incorporated as a nonprofit. The zoo was started back in 1969 as a place to care for orphaned and injured animals, including the zoo’s first resident - an Asian elephant named Annabelle. While the zoo is no longer in the elephant business, we have stayed true to our mission and roots as an organization that cares for wildlife in need. We are proud of where we came from and what we have become. But who do we owe our success to? Yes, we have had many dedicated staff members and volunteers over the years and we still do today. We have a group of core staff members who have each worked at the zoo 20 years and more. We have amazing volunteers who help to run our events and programs. We couldn’t function without them! 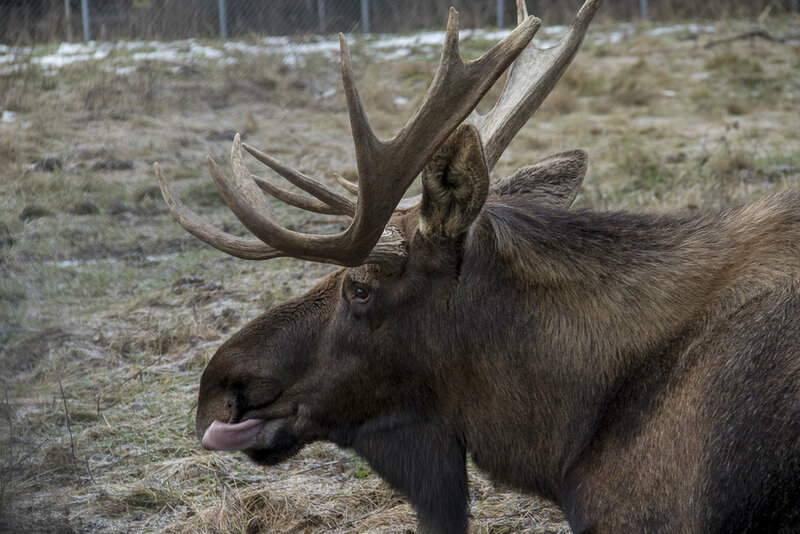 We have staff members who brave all of the elements Alaska’s seasons can throw at them to care for zoo animals all year long in an outdoor setting which is not always kind. Our donors have helped sustain us over the decades as well. 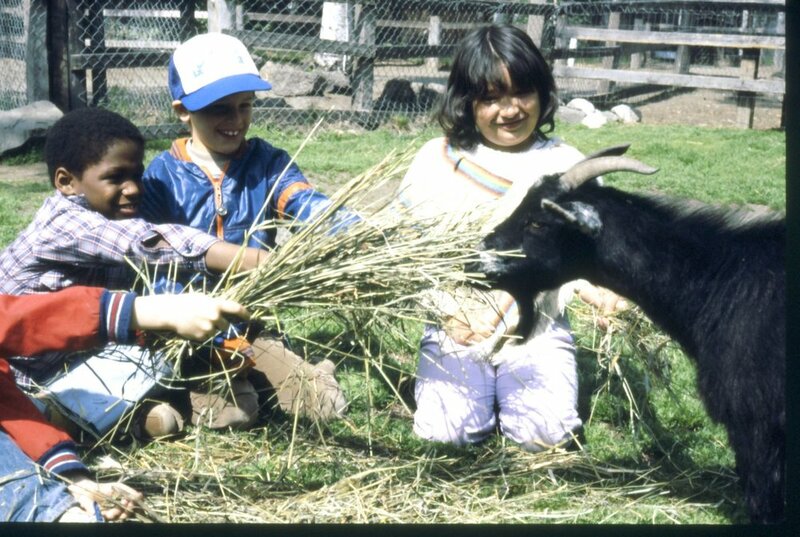 They come in all forms - foundations, community organizations, businesses, individual donors, those who have included the zoo in their estates and wills, animal adoptive parents, scout groups and more. Their support both financially and logistically has been instrumental in creating the zoo you see today. But there is another group of people who are the zoo’s bread and butter - our visitors! 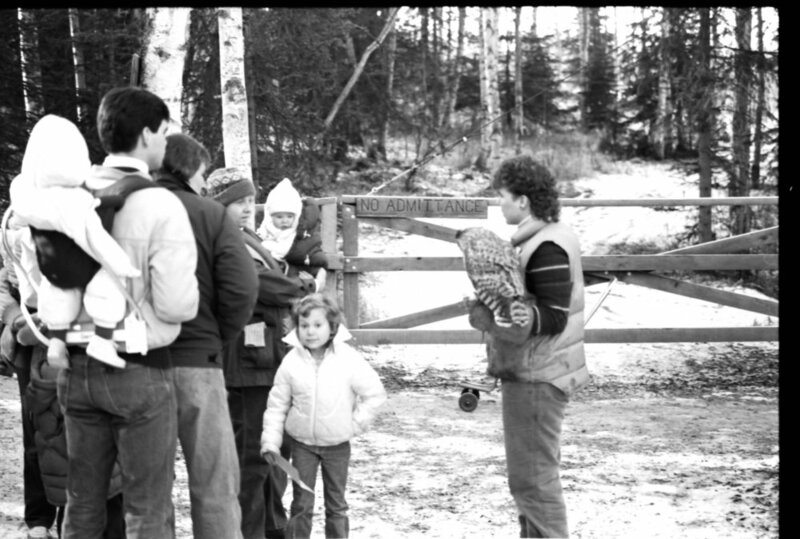 Over the past five decades, we have had a steady stream of local enthusiasts who have raised multiple generations of their families while making the zoo a part of their memories and lives. We have thousands of visitors who travel to Alaska each year and include the zoo in their vacation plans. Visitors pay for the zoo’s operations. The revenue they generate goes straight into our General Fund, the money used to maintain facilities, care for animals, pay bills and pay staff. These revenue sources include admission fees, gift shop purchases, coffee shop purchases, annual memberships, education programs, camps, event tickets and concessions. It doesn’t take a holiday like Valentines Day to make us realize how lucky we are! 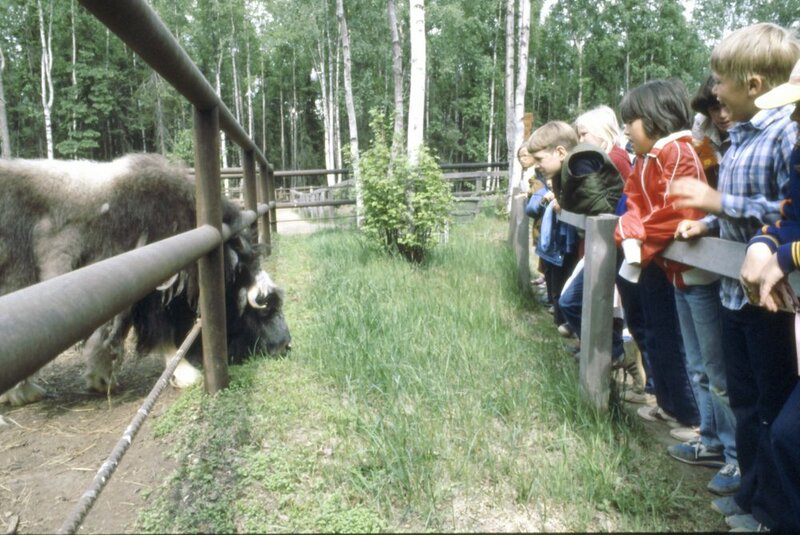 It is simply amazing how much of an impact visitors make with their dollars and desire to come to a truly Alaskan place - a zoo set in a forest with natural trails and cold climate species. Thank you for all of our staff, volunteers, donors and visitors. You are the village that supports our mission! Join us for our Valentines for the Animals event this Saturday, February 16th to continue sharing the love with our animals! Check out this recent article about our event. Kids will be FREE ENTRY for the event and Zoo Lights on February 16th. We hope you enjoy the gallery of visitor images below by photographer Bob Pate. Bob documented the zoo’s first three decades and we are so grateful to have his record of the zoo’s history! Lyutyik and Cranbeary during one of the scenes from their successful introduction held at 9am on January 31st, 2019. The Alaska Zoo’s newest resident Cranbeary, a 16-year-old female polar bear, met her potential mate Lyutyik for the first time on Thursday, Jan. 31. While Lyutyik owes the Denver and Alaska Zoo staffs — not Cupid — for their matchmaking skills, initial signs point to the two polar bears being a great pair. Watch the new friends for signs of a new romance through the polar bear web cam online. Visitors also have special opportunities to see them on days such as our $5 February Fridays and our upcoming Valentines for the Animals & Kids Free Day event on Saturday, February 16th. “We are glad to see the bears are becoming companions and know the community is going to be excited to see Cranbeary and Lyutyik playing together,” said Pat Lampi, executive director of the Alaska Zoo. Photos and videos of Cranbeary and Lyutyik can be found on the Alaska Zoo’s Facebook page. 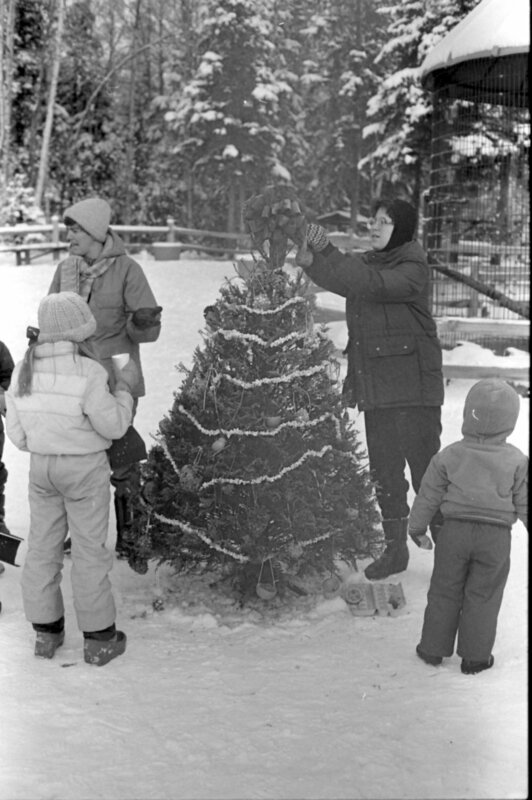 The Alaska Zoo is a nonprofit organization that has provided a home for orphaned, injured and captive-born animals for 50 years. Open year-round, the zoo is dedicated to promoting conservation of Arctic and sub-Arctic species through education, research and community enrichment. This Saturday is a special day at the Alaska Zoo. Each year, we throw an honorary birthday event for the zoo’s polar bears. While it may not be their actual birthdays, many wild polar bears give birth to tiny cubs in their dens right at this time of year. It is a cause for celebration! And no party is complete without treats and cake. We are lucky to have a new partnership for this year’s event, which will be held Saturday, January 19th at the Alaska Zoo from 11am to 1pm. Copper River Seafoods has joined forces with the zoo to make this the best Polar Bear Birthday event ever! In looking at pictures from past birthday party events, the staff at Copper River Seafoods noticed the snow cakes and colored ice blocks. Zookeepers, zoo educators and volunteers have always pooled efforts to prepare and unveil these creations at the party events each year. The bears always enjoy climbing on them, tearing them apart and finding the hidden treats inside. These photos of the bears enjoying their treats inspired Copper River Seafoods staff to get involved in the 2019 party event. 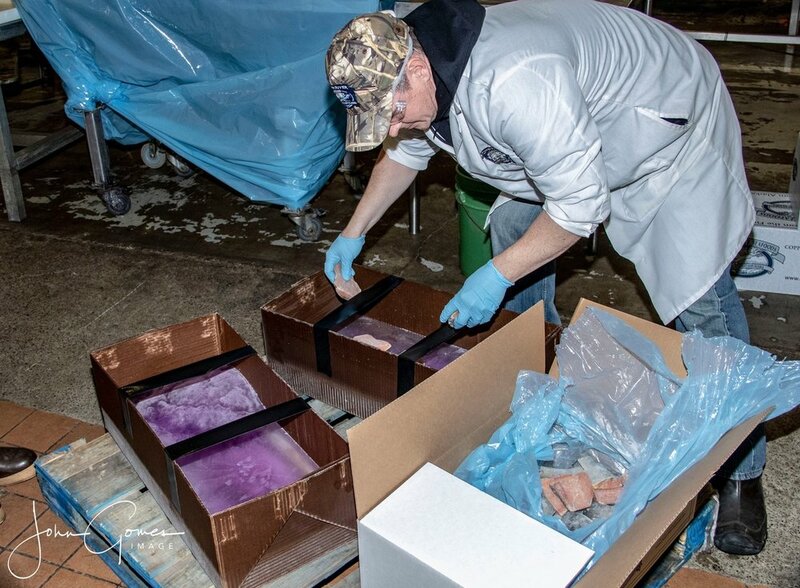 We sent zoo photographer John Gomes on assignment to document the artistic process and logistics behind a team at Copper River Seafoods who decided to make two items for this year’s party - an ice fish and an ice cake. When John arrived at Copper River Seafoods, he was asked to don the proper sanitary gear before going inside - a lab coat, hair net and even a mustache guard. He was escorted inside the processing area to document how staff were constructing these masterpieces. There are about six people working on the ice blocks which will make up the fish and cake. In total, 48 blocks of ice will be frozen with most to be used making the ice fish. The remaining blocks will be used to build the cake. Tasty fish treats are frozen inside of each block including salmon, halibut, herring, sardines and produce provided by zoo staff. A colorful cake is a must, so layers of colored water are frozen over days. The first layer is frozen, followed by a layer of fish and produce, then another layer of water. This process is repeated until each block is complete. Of the 48 blocks being frozen, the ice fish will take 35 of the blocks. It will be huge, roughly 14 feet long by 5 feet tall. The cake will be smaller and made up of multiple colors, roughly 4 feet wide by 4 feet tall. And for the cake topper? A halibut tail adorning the top! Meanwhile, back at the Alaska Zoo, we are in the process of getting Cranbeary and Lyutyik used to each other since Cranbeary’s arrival in late 2018. They are not living together in the same habitat yet, but we are working toward that goal slowly. Cranbeary was recently given access to the main outdoor yard on Tuesday, January 15th and she will alternate time outdoors with Lyutyik until the staff feel a face-to-face introduction is safe. While both bears will hopefully get to check out this event enrichment, it likely won’t be at the same time. It is up to zoo staff and the bears as to how they are doing. We hope to have a crowd for this fun event, starting at 11am this Saturday, January 19th. The zoo opens at 10am, so we suggest arriving before 10:30am to give yourself time to go to the polar bear exhibit. The fun will commence at 11am! We would like to extend our deepest gratitude to the hard-working staff at Copper River Seafoods. Their inspiration to build these enrichment treats for the bears will truly make this the best Polar Bear Birthday Party ever! To learn more about Copper River Seafoods, visit their website here. To explore the natural history of wild polar bears, visit the Polar Bears International website. To view Polar Bear Birthday Party event information, visit our event page. We hope you will join us for our annual Polar Bear Birthday Party celebration from 11am to 1pm on Saturday, January 19th. This year we are very excited to partner with Copper River Seafoods who will be building a wonderful ice cake for Lyutyik and Cranbeary, as well as creating a large fish sculpture to be placed in the habitat. The ‘cake’ will be filled with frozen fish, fruits and veggies - all exciting and delectable treats that polar bears love! For our party guests (hopefully you! ), we will have coloring in the greenhouse and s’mores at the polar bear habitat for all. We hope you will brave the cold to come out and celebrate this very special occasion with the polar bears! Each year we celebrate the honorary birthday of our polar bears as this is the time of year when all polar bear cubs are born in the comfort of their dens. We would also like to invite you make a Polar Bear Birthday resolution. While celebrating this iconic species of the Arctic, take a moment to evaluate your day-to-day activities. How will you do something for polar bear and sea ice conservation this year? How will you help polar bears in the wild? Will you lessen your carbon footprint by turning down the heat a few degrees? Will you make more of an effort to reduce your use of plastics and especially one time use plastics? The polar bears need our help and every action you take, no matter how small, will help give them a better chance in the wild. Thank you and we hope you will join us on January 19th!